Thomas and Christiana's son Henry Westlake Langman married Emily Elizabeth Humphrey on the 15th May 1909 at Greenwich Registry Office. She was the daughter of Charles Humphrey, a buider's foreman from Deptford. The couple lived at 82 Douglas Street (renamed Douglas Way). He was a marine stoker in the Royal Navy. Click here to see his naval record. The area was extensively bombed during the 1939/45 war which resulted in many of the houses in Douglas Street being totally destroyed. This area in recent years has been completely redeveloped. We have been unable to find any old photos of the pre-war Douglas Street. 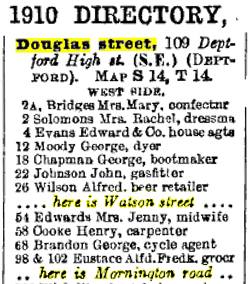 The 1910 street directory for Douglas Street does not mention number 82 but shows the house would be between the junctions of Watson Street and Mornington Road. The bomb damage map shows a V1 Flying Bomb made a direct hit on this immediate area.